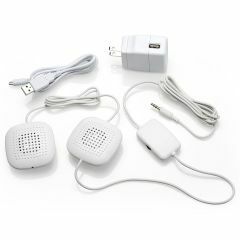 The PA-100 connects to any sound therapy machine or cell phone/MP3 player so you can listen to music or sounds in optimal relaxation and comfort. With built-in amplification and two high fidelity ultra-thin stereo speakers the high volume sound output is perfect for surrounding one's head with music and sound for enhanced therapy or privacy. Dimensions: 4.96" x 2.48" x 0.79"